Sunflower seed oil have less smell/flavor than other plant oils and is therefor more suitable for making peanut butter. Keep in a container with a tight lid and store in the fridge to slow down oxidation and separation of the oils in the peanut butter. Peanuts are rich in fibers, protein and contain a majority of saturated fat. Potassium, antioxidants, magnesium, vitamin B6 and vitamin E are also abundant in peanut butter. It is good for bone building and muscle recovery. 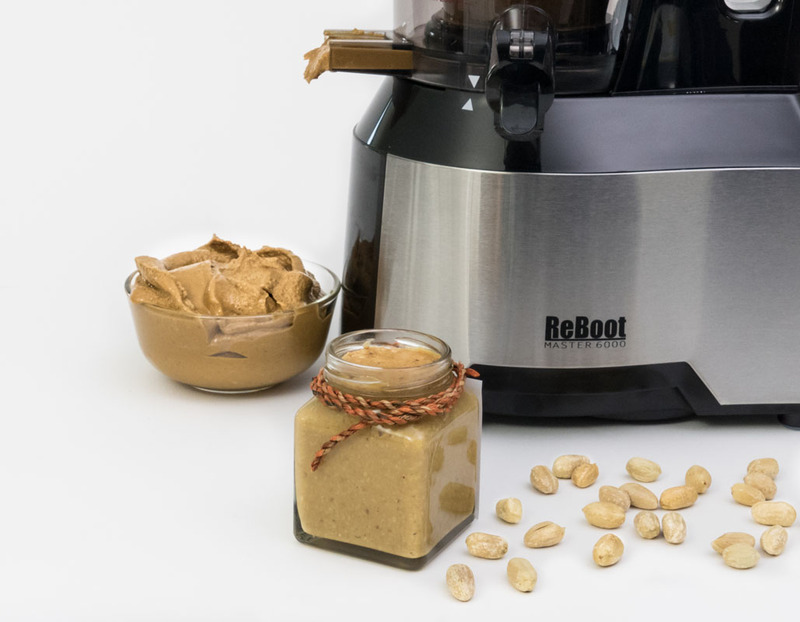 Home made peanut butter are free from hydrogenated fats (used to prevent commercially made peanut butter from separating) and the amount of sugar and salt can be controlled. Because of the high fat content it is best not to consume more than 2 tbsp of peanut butter per day. 1Check if the manufacturer of your slow juicer recommend it for making nut butters before proceeding with this recipe. 2Spread the peanuts on a sheet of baking paper and roast at 180 degree Celsius for 20-25 minutes until golden brown. Use a ladle to occasionally move the nuts to get an even roast on all sides. 3Alternatively roast on a frying pan at medium heat. Stir frequently to get an even roast until golden brown. 4After finish roasting let the peanuts cool down for 30 minutes. 5Grind the salt in a mortar until it becomes a fine powder. 6Assemble the juicer using the blank strainer attachment. 8After all the nuts have been processed add the powdered salt and honey to the peanut butter in a mixing bowl. Use a strong spoon to mix the ingredients (alternatively use a dough mixer to mix the ingredients) . Add more oil for a softer and easier spreadable peanut butter.